With the release of X_STUDY® 7.8.0, users of our charting application can now apply a technical indicator (or study) to the value of another technical indicator. Although this feature can be used in many ways, two primary ways are to help measure market conditions and increase or improve trading signals. I’ll show a few simple examples of this feature, which we call study on study. A classic study on study is to place a moving average on the volume indicator. Averaging the last few volume bars helps to gauge what kind of tempo the market is experiencing relative to the past. In addition, volume levels are compared to averages, especially at highs and lows. 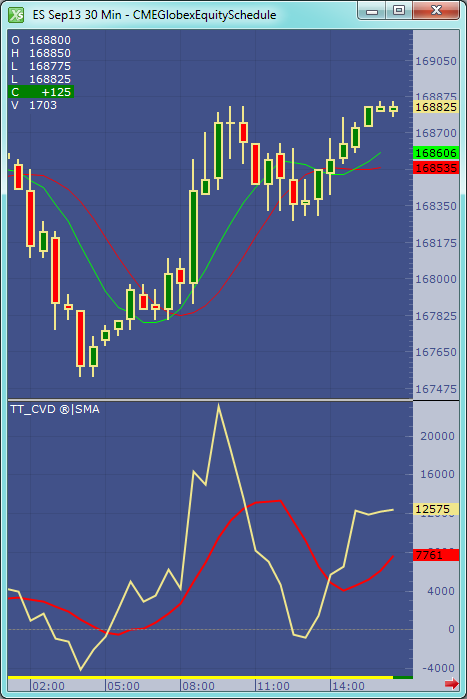 Figure 1 above shows a chart with a red moving average placed on the volume indicator. 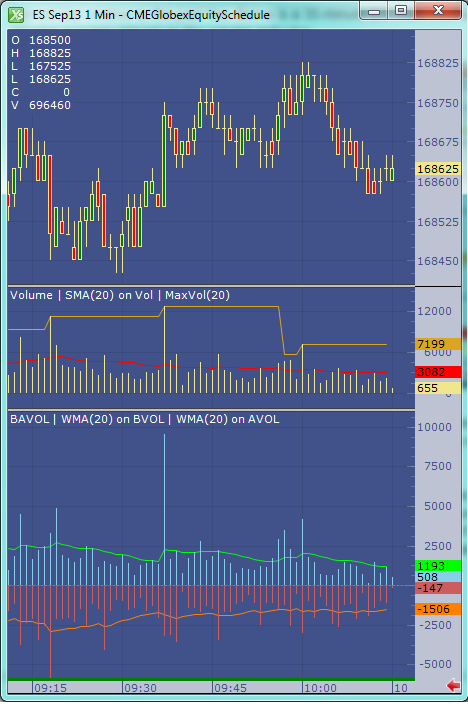 Notice I also added a second study on study with an orange max indicator applied to volume. This max study simply finds the maximum value over the user-defined look-back period. Both the simple moving average and the maximum indicators are looking back 20 bars. I like to take this classic example a little further by using the bid-ask volume indicator in X_STUDY. 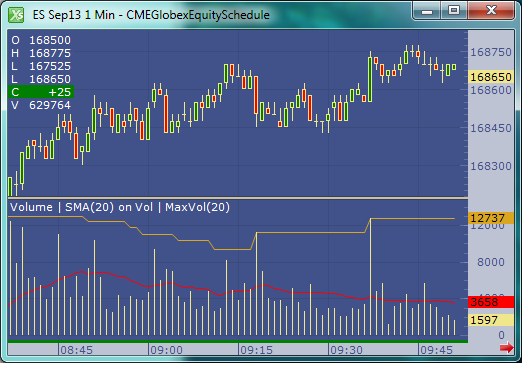 In Figure 2 below, I added a weighted moving average to both the bid volume and ask volume. This setup can help determine if a market is moving due to increasing pressure in the direction of movement or if the movement is due to lack of pressure in the opposite direction. Notice the clear buying pressure spike at 9:37 a.m. A little harder to see is the dropoff in buying, while the selling remains constant from 10:00 a.m. to present in the chart. The average ask volume (buyers) drops from around 2,000 to 1,200, while the average bid volume (sellers) remains steady around 1,550 contracts. With study on study, you can create several new entry and exit signals. Simply adding a moving average to your favorite study should give you more entry and exit signals. As an educational example only, I’ll show how study on study turns TT CVD® into a trading strategy. If you aren’t familiar with TT CVD, you can read more about it in one of my prior blog posts, A Leading Technical Indicator for Charting in X_STUDY®: TT CVD®. Figure 3 above shows a chart with TT CVD and a simple moving average on TT CVD. I also have two moving averages. The first is a moving average of the closing price, and the second is a moving average of the first moving average—another study on study. Since this is for educational purposes only and the ES market has been bullish for years, this strategy might only take long signals generated when both the TT CVD value is above its moving average and when the green moving average is above the red moving average. I hope these examples give you a few ideas as to how you can leverage this new feature. Check out this short video What’s New in X_STUDY® 7.8 to see some of the other awesome features. And for more information on all of the new studies, take a look at this list of technical indicators.